"Change in flight plans! Sorry that it's so sudden! Love you guys though! Let me know if you don't get the attachment. He now arrives on Oct 19th (Wednesday) evening - same time. He did respond quickly to his Mom's email sent this morning (his Mom wondered why the sudden change). He basically said that the first flight was set up on the wrong date. The Wednesday flight was what was planned all along, they just didn't realize it was wrong. I guess I need to send next Sunday's email after my wife in order to 'really' send the last one. Elder Murri shared his testimony with his Mom, and shared with her some of his plans regarding how he would like to remain close to the Savior upon his return. I wanted to post them here but then felt like they were his, so even though they are goals we should each have, and even though he said them so well and the way he said them inspires me to do better I will forbear. Let me finish by sharing a few of the ending statements from his email. I am Elder Murri. I am not perfect. I am filled with and often marred by the mistakes of men. But my weakness is so often made up in the strength and grace of Christ, for which I am so grateful, and eternally indebted. I love the people here in England. They will ALWAYS have a large, large place in my heart. I have been blessed beyond belief these past two years. I know that God lives. I believe in Him because I have felt His love, and by Him, I have been healed. I will soon return, but part of my soul will always be here. How great a blessing it is to serve my God, and serve me fellow men. How wonderful is the Atonement of Jesus Christ! I'll see you in a week and a half. We received this email from Elder Murri:"
Tried to send it before, hopefully it'll work this time. Here is your flight information. You have been such a wonderful missionary and we sure hate to see you go. Please forward this information on to your family. We love you for all your wonderful service to the Lord. I like how he said, "It's happening. Wo." Yes, it is happening ... the attachment he forwarded are his flight plans. He arrives in SLC from London at 7:16 pm on Oct 16th ! We will be hearing him speak about his experiences in our church building (7250 N Porters Crossing Parkway, Eagle Mountain UT 84005) on Oct 30th at 10:30 am. All are welcome to attend. He will be speaking during our ward's Sacrament Meeting ... usually about an hour and 20 minutes. From the deepest reaches of my heart, I look up to you. You're my spiritual example. I don't think that I've ever met anyone else who has as much charity as you have. Moroni, and Paul both tell us that "charity is the greatest of all", and "charity never faileth, and that "whoso is found possessed of it at the last day, it shall be well with [her]." I think that you'll be fine in that day. Moroni goes on to say that the reason that people with charity will be fine is because they'll recognise the Son of God "as he is", because "[they] shall be like him". You're well on your way there. Thank you for paying such a high price to be where you are spiritually, so that you can be my example. You're more people's examples as well, but you're a special one to me. I love you. ️ ". What a tribute to his Mom. I could not pass up posting this. Now, Jed also has a 'fun' side. He had a family sing (in the wonderful English accent) Happy Birthday to his Mom - view the video here. 2. When do you wake up? 2) 6:29 or earlier. Always. 3) I'm emailing, and doing a little bit of research on what I want to do with the rest of my life. That's important." 1. ...how many times have you read the scriptures? "I don't even know. Maybe a lot. I always read them, and I love them though, because they're cool." Transfers were announced on Monday. Mom. After more than a year of being a zone leader, I've been released for my last transfer. I'm going to open a new area and train a new missionary in a place called Ipswitch ... This is one of the most bittersweet moments of my life. I have loved being in this position where I could be close to all of the missionaries in the Zone. This last one, I think that I was the most close to the most of them that I've ever been in any of my zones and in any of my transfers. I have honestly loved and treasured them. I've actually been pretty emotional all day as I've been calling all of the missionaries and saying goodbye. It's been a big part of my life. But I'm WAY excited for this new opportunity. :) I love it. Miracles will happen. :)"
My last email to Elder Murri was very short ... I just let him know I was proud of the service he was providing both to the folks in England and to his 'new' companion. He replied, "... I love the kid! His name is Elder Gago, he's from Portugal, and he's never tried peanuts or jumped on a trampoline! Needless to say, he's done those two things now. 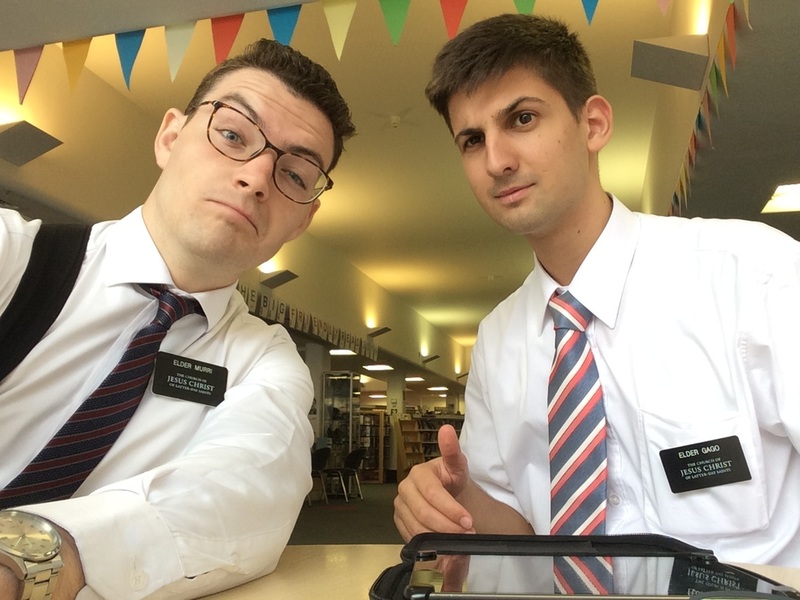 Haha :) here's a picture..."
​What a great opportunity to share some of the experience he has had over the past two years with an Elder that is just beginning his service to those who live in England. It would be wonderful if I could convey to Elder Gago's parents that I feel their son is in a really good place. I just want to go back to a statement I mentioned above that Jed made to his brother ... and wonder (I guess I will find out) what he was thinking "...and doing a little bit of research on what I want to do with the rest of my life....". Whatever it is, he will do a great job - especially if he has the Lord's blessing. Those of Jed's family who are still at home were able to attend a family reunion. The reunion was in Delta, Utah (it appeared to be a pretty small farming/ranching community). We were quite impressed and even got to know a few new cousins/extended family. One of the activities was to take a tour of a dairy farm. It was really very enjoyable and we learned a lot. I shared with Jed some of the experiences, pointing out that I had a new respect for folks who worked so hard for things we often take for granted. He said, "From what it sounds like, milking cows is definitely a skill, too. Living out here (probably the same for you, too, when you were in Hawaii) has helped me to [realize] the same thing. I'm blessed. I mean, Watford is in London, basically. It's like the outskirts of London, but to get to the London temple if there's traffic takes almost three hours! The temple isn't actually in London, but the point is the same. Man, the house [where Jed's family lives now] is next to like 6 temples, and you can get to each of them in 40 minutes. We're really blessed. And you get to come home and we get to see you, that's a blessing too." Elder Murri shared a little about how his week was going, saying, "This last week was a blur, really. All of the days seemed like one day ... We met a guy called Rex, which was a pretty cool experience! We were waiting for an investigator called Daniel, and he didn't show up. So we decided to talk to people, and we found him, and taught him a really cool lesson on the street, and it was pretty nifty! He's very recently been kicked out from his house and made homeless though, so he doesn't have a phone or anything so we weren't able to contact him at all, so we set a return appointment with him and hoped that he'd remember it. Anyway, we had another appointment with the same guy, Daniel, who didn't show up (again), and we had a member with us, so it was sort of disappointing. But lo, and behold! Who walks by us again but Rex! So we taught him again, and it was a good lesson! It seems like Heavenly Father wants us to teach him! That was a cool experience though." He shared a few more items and then this, "Honestly, the rest of it was just finding and teaching and traveling and going on exchanges. And all sorts of stuff. I have a great, great companion. I love the guy. I've sort of always wanted to go to Germany, but now I have a reason to go. And somewhere to stay, if I go. Hopefully." When you spend 24/7 with your companion, it is a great blessing to feel he is great. I appreciate that Elder's Mom and Dad and ward for the effort they put in to raising a son that my son could serve the Lord Jesus Christ with. In a recent letter to his Grandma and Grandpa he was telling them that he was very busy and that, "... this past week has been a blur. And we're [he and his companion] both super tired. But it's good when we get to rest. I read a quote in the Gospel Principles book, "Doing nothing is the hardest work of all, because you never get to stop and rest". How true is that?". I asked Elder Murri if when he returns he would be willing to share some of his experiences with the youth in our area. A night were we have them over to our house and he could share and let them ask questions, etc. "Yes, I'd LOVE to do that! It would be so much fun! It's not long now huh?" was his response. True, not long now. "...I don't think that God wants you to feel that way..."
I realized that my last post was posted at the end of June. First, the photo ... it was titled "wet shoes!!". Now, I realize and apologize for not sharing (the long space between posts) some of the correspondence from Elder Murri. He said in a recent email that someone felt like they are "...often caught in-between walls of guilt and regret -- guilt because [they] didn't do something that [they] know that [they] should have done, or could have done, and regret because [they] didn't do it." I guess that we all feel this way at some point in our lives for some reason. I do when I think about the time between posts :). He says, "...But I don't think that God wants you to feel that way. He's there to deliver us. To deliver us. What a great sentence." I know from some of the great feelings I have felt from our Heavenly Father and His Son Jesus Christ, that what Jed says is true. Elder Murri shares in another email an experience that backs this up. "This week has been just phantasmagoric. I've realised a lot of things this past week. We've actually had some really, really cool experiences this past week. Some had been really sacred, and I wouldn't hesitate to say that they've changed my life. That's the cool thing about the mission. You have all of these amazing once in a lifetime opportunities where you can learn things that you could never do outside! ... we had a meeting with Elder Kieron, who's our area president in Europe. He and his wife came to the mission and talked about chapter 11 in PMG (which is helping people make and keep commitments), and a couple of other things. It was SO spiritually powerful. And then, he came to MLC with his wife!! I honestly don't know how to describe what happened in that second meeting. I don't have the expressive power to describe it. I've never felt the spirit that way before, it was totally unique. It was new. Mom, and whoever else reads this, there was something else in the room with us. The whole time. It touched our hearts, quite literally. That's such an understated description. I feel like Moroni when he said that he couldn't write as powerfully as he felt. 3 Nephi 17:16-18 describes my feelings well." This is the way God wants us to feel. So given England's history with the United States, Jed heard from a few of his family (and grandparents) the age old pun/joke/? "Does England have a fourth of July?" The answer of course is that England does have a fourth of July, and a fifth and sixth ... etc. Anyway Jed said, "P.S. HAPPY 4th of July!!! Yes, England has a Fourth of July. (But they don't celebrate it. I had a suspicion that that was coming!) Although, I'm not sure how they feel about the one person who does celebrate it singing the national anthem down the street to the train station in the morning.. :) P.P.S. Zach's at basic training on the 4th of July. You've got to admit, that's pretty cool. That's the place to be on the 4th." Elder Murri shared with his Mom about some thoughts regarding the Sabbath: "Just some scriptural thoughts about the Sabbath now, I think that the Sabbath Day is really, really cool. It's a "sign" between us and God. We make that "sign" most powerfully, I think, in our attitude towards and during the Sacrament. It says in 3 Nephi 18 and 20 (8-9) that after the Sacrament had been administered to the Nephites, that they were "filled". I don't think that that "filled" meant that they weren't hungry for food any more, rather, I think that their spiritual stores, which had been depleted after an extended period of rebuilding fallen cities, learning to cope with the loss of people that they loved, and all of the other changes that came as a result of Christ's death. That's like us. We use spiritual fuel throughout the week, and if we don't re"fill" ourselves, then we won't be able to go any longer. We'll die Spiritually. I'm grateful for the Sacrament and the whole entire Sabbath Day where I can just be close to God. To my Heavenly Father. I don't think that there's a Sunday that goes by where I don't feel a special spirit on the Sabbath. It is truly "made for man". I love it." At the end of July Elder Murri told us: "So, the reason that I didn't email you yesterday was because it's ALREADY transfers again! I'm staying in Watford!! Elder Mthombeni is leaving to go to London North, and I'm going to be getting a new [companion] named Elder Falke, he's from Germany too, so I'll be able to work on my German! :) I think that that'll be fun! I don't want to make an unfair prejudgment, but I feel like it'll be a little bit of a culture change, going from an African companion to a German one. Pretty much the opposites in culture. But it'll be super good, and super fun. I'm excited." One of the benefits about not posting after each email is that I can post a follow-up to this. He says in a more recent email, "...I love my companion. He's my friend. He teaches me a lot of things (even German). It's fun to work with him." I too enjoyed my companions and felt I also learned from them (well, I guess I didn't learn German from any of them). Elder Murri shares a great truth in his most recent email. His explanation is great and I would like to share, "I've been thinking lately about an interesting thing -- based on the amount of opposition that you receive, you can gauge the potential of the next developing situation in your life. For example, if you start to experience opposition from seemingly all sides while preparing to return to the temple after a period of absence -- more opposition than you'd normally get -- then it's reasonably safe to assume that a greater spiritual blessing awaits you at the temple, if you're able to push through and prove faithful through that time of trial. Satan understands that, that's why He tries to tempt us when we're at our lowest, because he knows that the light at the end of the tunnel strengthens our testimony! He knows that that's exactly what that does! So he tries to suffocate it, and tempt us to give up faith, therefore losing some of the blessings attached to the end of that trial. It's like it says in 2 Nephi - "there must be an opposition in ALL things". But, if we prove faithful, then our reward will be equal to or greater than the opposition received before it -- probably so much greater than, that the reward will dwarf the trial just endured until it fades from our mind." I told Elder Murri to make sure he stays busy and to use the precious small time left to serve full time in England. He said, "I will keep focused. I'll try my best. :) I've learned that that's really where I'm most happy (when the focus is on others) (that's true for anyone too, not just me). It's just the getting there part that's hard sometimes. But I'm trying, and I'll continue to do so. Any practical advice for the missionary coming to the close of service in the field?". I will be sure to share some thoughts with him. I am very proud of him and feel like he is a great asset for the Lord Jesus Christ in England. In Jed's June 6th email to his Mom he shared a few miracles. I would like to share this paragraph here: "We so had a miracle earlier in the week as well! On Monday, our car got locked in the shop (long story), and so we were stranded in town center (which isn't in our area), which was really frustrating for both of us, so we ended up standing on the corner of the street playing our harmonicas (we both have one), until we ended up talking to this Chinese kid, and he happened to live in our area! First miracle! He said that he wanted to know if God was there, and he was keen to try reading the Book of Mormon and praying, so we were able to get his number and set up a return appointment with him for Wednesday. It TOTALLY changed both of our outlooks on the day, and then, one of our awesome, awesome members asked us to come over to theirs for dinner (miracle 2, 3, and 4)! Then, we met with him on Wednesday, and committed him to come to church, and meet with him before, and he came! And we met with him, and extended a date for the 9th of July (miracle 5)! Then, he told us that that wouldn't work because he worked on Saturdays, so he wanted to get baptised on the Sunday, the 10th. Another miracle! He's so, so cool. So that was a miracle. Many of them. One of the many." 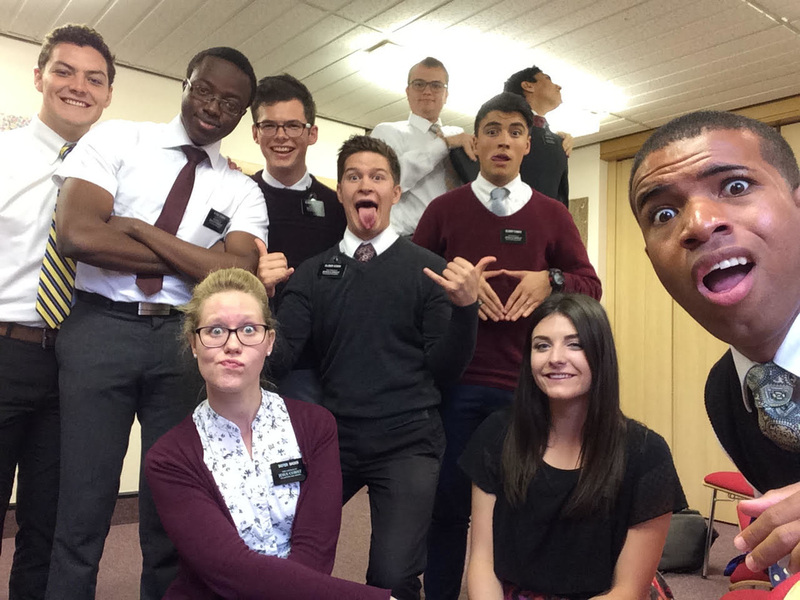 In Elder Murri's June 14th email, we found that he has moved from Northampton! In his words, "Hey, sorry that I didn't email yesterday, it was transfers!! I felt that I was moving, it was one of those things that you just feel, you know? It was just a little inclination that that gnawed at the back of my mind for a couple weeks before we got the call, and even though I didn't pay much heed to it, it turned out to be right. I'm moving areas. But here's the catch -- I'M GOING BACK TO WATFORD. :) I served there for my first transfer as a zone leader ... now I get to go back there and have another go! I'm really, really sad to move -- this has been the best ward and stake that I've been in -- but the move was good. It was needed. I'm glad that I can get out and start a new thing. It's so refreshing to be able to do that! So I'll be back in Watford tomorrow! My new companion's name is Elder Mthombeni, he's from South Africa, so he'll be able to teach me Xhosa and Afrikaans and everything. I'm looking forward to it. ". I also served in the same area twice (serving in the North Shore of Oahu two Christmas seasons in a row). It is an awesome experience. Before he left he was given a proper birthday party ... and it seems that he is not content to just live and serve in that area of the world ... but wants to move there. Not sure how Scotland fits in, but " ... So, the members in our ward gave us the best birthday party in the world. And tons of chocolate, and tons of chilli jam. Also I'm going to buy land in Scotland so that I can be a certified and authenticated Lord. Hip hip cheerio! " Elder Murri told us that he has found a new perspective of missionary work, gained from listening to an Apostle of Jesus Christ. He says, "I'm not sure if I told you, but this last week we were able to listen to Elder Oaks TWICE. 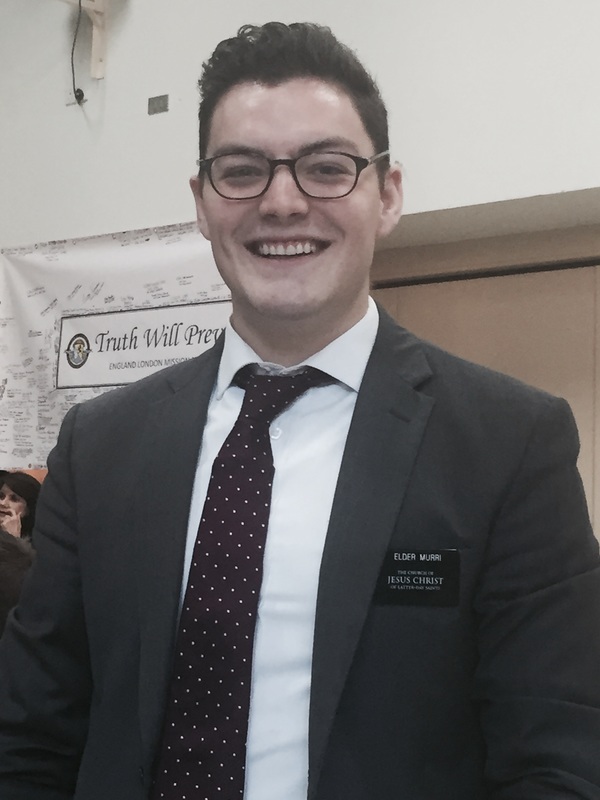 He came to Northampton Stake and then to the mission, and he changed my perception of how missionary work should be, and that's really helped me. D&C 16:6 says that the thing that's the most worth unto us (as missionaries and members) is to declare repentance unto this people. Everything else in missionary work -- baptisms, people going to the temple, converts -- they all come as a result of you teaching repentance. Teach repentance and baptise converts -- that's our charge -- but teaching repentance stands independent from baptising converts. An added result of understanding that concept is that as you focus on teaching repentance, you become more converted. It's an upward spiral. One that can negate even the most perilous downward ones; that's the beauty of the gospel of Jesus Christ in action. As you lose yourself in teaching others how to repent, you are healed as a result (Luke 9:23-25). I'm still learning how to do that. It sounds great on paper. It feels even better. It just feels good to know that Heavenly Father doesn't look down His nose at you as you press forward. He's right with you, by your side. On your side. Pressing with you. What a glorious, exciting, enabling feeling!" He continues with a description of his work (prior to being transferred) ... "...The work is going well. I love Alma's description to his son of "miracles". He says in Alma 37:40 that they were wrought by the power of God before the Nephites "day by day". That scripture can be taken literally, I think. We can see miracles every day, we just have to be mindful of where they are.". Lastly ... we received a letter from the Mission Home yesterday that gave us Jed's official release date - Oct 19th. Seems very soon. 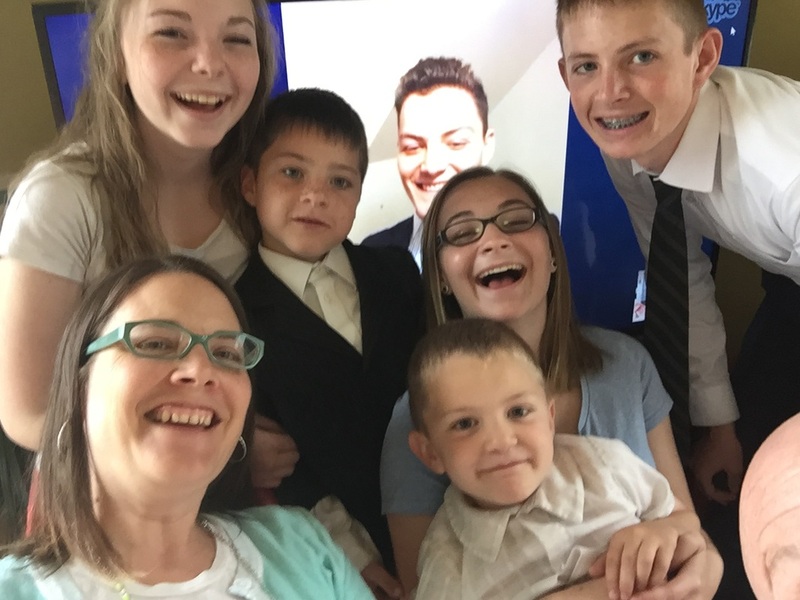 We were able to Skype Elder Murri for Mother's day. I guess we don't have photo skills 'cause this photo doesn't have all of us ... or even all of us in the photo :) - but Jed is in there! Jed's little brother decided since the weather was getting warmer that he would take Jed's long board out for a spin. It didn't end the way he was expecting ... a few Steri-strips over the eye brow later and aside from some pretty good road rash he is feeling better. 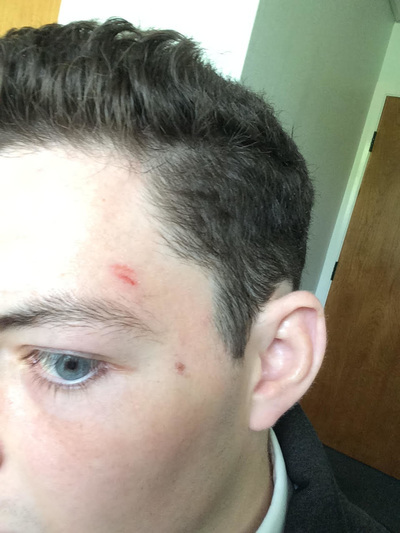 Jed found out, and the next email from Elder Murri had the heading "I'm like Sam" and this picture. No explanation. However, in another email he told us a little about it. He says, "I sort of did that to my face as well ... There was young men's the first night that Elder Ammermon got here, and so they were grappling on the carpet .. so I joined them. #victory ... I ripped the scab off the other day, because it looked bad". From that we learn he is ok, and still enjoys a little physical activity. We were aware that his companion had served a full two years so he was going home, and so his new companion (as he said above) is Elder Ammermon. " --- So, just a quick side note, Elder Ammermon and I just walked past the chapel, and there's a grand piano there, so he was like "do you want to hear something?" and then he KILLED it on the piano. I stood right next to it and listened and just about got weak knees. It was actually really cathartic, because I feel like I've been under a lot of stress lately, but that sort of released a lot of it and opened me up. I feel like music has that effect on a lot of people. Heavenly Father is really clever, isn't He? He can speak to us in all kinds of different ways! " I absolutely agree that music plays an integral part in our spiritual lives as I was touched so deeply this past week listening to a good brother play the piano solo of 'Oh How Lovely Was the Morning'. This song is about the young Joseph Smith deciding to go to the Lord in prayer for answers, and being visited by his Father in Heaven. Music can be powerful, and I, like Elder Murri feel that He can speak to us in all kinds of different ways. As an full time missionary for Jesus Christ (or any of us) - you have a limited resource, time. As an Elder on the Lord's errand He will bless you to use that time for His purposes. 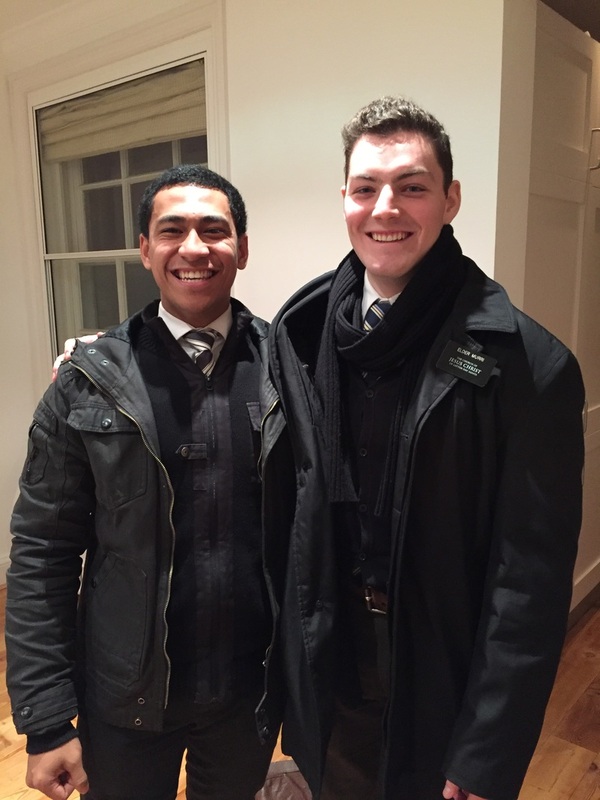 Elder Murri shares this, "Here's a little miracle: Elder Ammermon and I were on our way to a dinner appointment, and we had 4 minutes to spare, so we parked the car and decided to dedicate those minutes to finding someone, so we said a prayer, and started talking to people. The first lady wasn't interested, so she walked down the street past us, but when she'd gotten about 10 feet, she turned around and said something like "you can talk to that guy cleaning out his car over there" (or something), so we did. And we talked about the Book of Mormon, and how it would help him and his family if he learned more about Christ from the Book of Mormon, and we set up a return appointment with him and we're seeing him on Wednesday! It was a little longer than four minutes, but the Lord blessed us nonetheless. That was our miracle." There are good things happening in London. So I get this text from my brother who served a mission in England (the Manchester Mission) ... "Recognize this guy?". I know my brother has visited England a few times since his mission and I haven't talked to him for a few days so I respond, "Nice!" .... ('cause the picture with his question is Jed in what looks like a bathroom? in a Church building) - Then I say, "are you in London?" He tells me that he is not in London (but he wishes he was). One of his friends was in London and saw the name "Murri" and then sent a couple pictures of Jed. Pretty cool. Elder Murri emailed me 6 photos; it looks like he visited a church from 680 A.D. and then sent a picture of the Elders and Sisters in his zone or district probably ... and then there is one of a sister who has chosen to listen and accepted the gospel of Jesus Christ and is getting baptized. Pretty cool. Elder Murri also wrote a handwritten letter and sent it with a Sister who lives in England and was coming to Eagle Mountain ! to visit her sister. She came to our home and gave us that letter. I took a picture of it and then we also took a picture with this good sister. Pretty small world, and pretty cool. ​While we were visiting with this wonderful sister from England, she told us of a recent experience with Elder Murri. She is the Primary President in her ward. (Each ward not only has classes and opportunity for the adults to learn and worship, but also classes for the kids - Primary. The teachers are asked to teach these classes, and every once in a while they are sick or not able to come.) She said that she asked Elder Murri and his companion to take one of these classes. She said she peered in the window to make sure everything was fine and found the class all throwing paper airplanes! Elder Murri said to me in his recent email, "... in our defense, we were using them to demonstrate how to use faith. I'm not sure how much they remembered about the faith part of the lesson, but it was fun anyway. They were 6 and 7 anyway, which means that they were a mite hyperactive. I know that I've said this before, but I think that you would adore little kids with English accents." So, do you get to watch any of conference? If so do you watch it as a ward, or as a zone or ? Do you have any 'new' missionaries in your zone? I am guessing you took your driving test again? What is the funniest thing that happened to this week (there are often funny things that happen)? I can remember the smell of rotting sugar cane and red dirt mixed with flowers and ocean (to me a heavenly Hawaiian smell) ... are there any smells that you really enjoy? "1. Yes, Saturday morning and Sunday morning and Priesthood. 2. We do, one is from Malaysia, called Sister Chipping. We've got a couple of relatively new ones, but she's the only one being trained. 3. No I haven't, parking ticket when buying my new contacts, but scheduling. 5. I LOVE the smell of the salty sea and morning by the sea and old, damp buildings and everything. I also love the smell of England. Every city or town has a smell, and I like how distinctive they are. A good roast dinner smells great as well. " I told Jed that he was not going to recognize the little area where we live because there is so much building going on. He seemed to relate to that and said regarding England, "Surprisingly, even though England is an old place, there's a ton of building that's going on here. Speaking of that, we got to go help a member on his farm the other day and he had us do some hard (at least for missionaries hard) labor, and it was SO FUN. We got to split probably a half-ton of logs with big axes. MUCH needed manual labor. He lives in a house that's heated by a wood burning stove, so that's what they were for. Super fun." In addition to all the new homes in our area, the building of the Provo City Center Temple was recently completed. When a temple is finished being built - before it is used, it is dedicated to be a House of the Lord. It is a special time and often the veil between the heavens and the earth is thin. Both me and my wife shared our experiences of the dedication with Jed. He responded, "That temple is going to be so cool! I bet it's booked for the next year straight though. It'll definitely be buzzing for a little bit. You've got to tell me how it is when you get in there! I do remember the feelings of peace that I felt in the temple. I like what you said, "I am again reminded that there is so much more to this life than this life." It's really true, and I completely agree with you. There's a whole spiritual world around us, and it's real, and there for us to take part in! Having your soul be full is a lot more fulfilling than anything else that I can imagine, and I imagine that it probably gets better over time." He shared one of his favorite scriptures with his Mom: (link here) 44 For behold, it is as easy to give heed to the word of Christ, which will point to you a straight course to eternal bliss, as it was for our fathers to give heed to this compass, which would point unto them a straight course to the promised land. and added, "Alma 37:44-47 say [it] beautifully. Much better than I could, at least. Give those a read, those are some of my favorite scriptures ever. :) It wouldn't be true any other way! Heavenly Father will always lead us safely home! I have faith in Him, and that faith frees me, and it can you as well." I was talking with a friend at church and heard him say something like, "I realized that my journal didn't even know I was married". I have thought about that and took some time to peruse the journal I kept as a missionary. Now granted, I am not the poster child for keeping a journal, but feel it is an important and worthwhile goal to pursue. I asked Jed if he is keeping a journal. He said, "So, I'm really guilty of not writing in my journal. We get home and then usually have tons of stuff to do still, but I guess that's what it's really about, making time to do things that you don't really have time to do. haha :) I should really write in it more. I keep a study journal now, I have done for ages, and that's really been cool. Heavenly Father gives us some really cool insights into the Gospel that has been provided for us, and when we write them down and record them, we have them forever! It's really nice to read over them and remember what you were dealing with at that time, and why you chose to record what you chose to record. I'll definitely do better at that though. I need to keep even just a daily paragraph or something. Maybe that's what I can do during studies in the morning or something maybe. " Like Jed, we should be more diligent in our effort to record the experiences and impressions we are given ... whether they be scriptures we read, temples we attend or axes we swing. So I start with a few photos. The one that "...a way cool guy took..." is before he was transferred to Northampton, the two others (can you see the difference) are Jed and his companion Elder Eliason in Northampton. Since it is getting more spring like here in the state of Utah, I was telling Jed that while I was enjoying the weather - I woke up to frost on the rooftops that morning. I asked him if he ever saw frost in England? "It frosted this morning. It gets pretty chilly here. But it's a different kind of cold. Kinda like if Hawaii would have been cold (which is a daunting thought)." That would be a daunting thought, and I am not sure the surfers would enjoy that too much. Elder Murri must have read a talk from the Apostle Elder Ballard recently as he tells his Mom, "I, like Elder Ballard (he talks about it in his talk "Following Up") ... have learned again the importance of follow up this past week. I know that you have to do it with love, but also be stern. Those two things can and should coexist. When they do, that's when you know that you're helping the person that you're following up with improve." Elder Murri shares a little of his thoughts regarding two chapters from the Book of Mormon, of really a part of the crowning event in the Book of Mormon. These are a few of the chapters about the time Jesus Christ spent on the American continent among the Nephite people, (the link here). I feel this a fitting end to this post as I love the emphasis Jed places on whom is praying for who to our Father. He says, "I love the part in the Book of Mormon where Christ prays for the Nephites. He prays for them. I can only imagine that happening. They even talk about how sacred that was, and how special, but I can also only imagine that He does that for each of us, when we repent. He is the Mediator. He's the Christ -- the Anointed one -- the only one that's ordained to be the bridge between us and Heavenly Father. I know that it's like that. I know that He's like that. I love Him for that." Elder Murri wrote to his brother who was just sworn in to the Utah National Guard. He said, "Man, I heard that you smashed the auditions for the National Guard band, that's AWESOME!! Congratulations!! I'm way proud of you! I've never really done anything like that in my life, so I'm proud that you've accomplished something like that! I love you man! Congratulations for making it on. Well done. In England, people say "well good", but I'm not sure that I like that. So well done. You've done well good. Proper nice. Brilliant. Are they going to send you somewhere to do basic training, or are they going to keep you in Utah, do you know? I think that it would be really cool either way! Man, I'm just proud of you." I appreciate that Elder Murri is a supportive brother, he is a good example to us all. Elder Murri shared a recent experience, "We actually had a crazy thing happen to us on Sunday! Since we have a car, we can drive to places and see more people than we otherwise would be able to without one. So on Friday, we both felt like we should stop by this girl called Sky (we have her teaching record in our area book). We stopped by her house, but we didn't get an answer. Then, on Sunday before church (our church is at 1 out here -- and just a side note, the ward is AMAZING), we felt like we should stop by her house again. So we did, and rang her, and her kid answered, and on the other side of the line, it sounded like some crazy girl that was screaming at us, and everything was nuts in the house, and we heard a girl in the background say something along the lines of "go away," and everything was crazy. So we just left, and went to church. We then show up to church after picking someone up, and the sisters in the other ward come up to us and ask us if we're teaching anyone named -- guess who -- Sky. Elder Eliason and I both looked at each other and, just like Alma when he saw the prayers of the apostate Zoramites, were exceedingly astonished. So she had come to church because she felt bad that she was rude to us. She stayed the whole three hours, and now we're teaching her! It was a miracle!" He said, "The work is going well!" and another teaching experience "...We watched "The Testaments" at a cool guy's house the other day (he even bought us pizza), and it was so, so powerful. I know that Jesus Christ lives. I know that he loves me. He says in the Bible to His apostles, whom He also loved very much, "greater love hath no man than this, than a man lay down his life for his friends." I love Him. He is my friend -- my best friend. My confidant, my counselor, my example. He calls me His friend when I keep His commandments. I love Him with everything that I have. Even though it's not much. That's what drives me now. The Gospel is REAL! ". He also shared some photos, apparently he is running out of clothing ... "Also, my grey suit is trashed, and (as we all could see -- literally) my black one is also a little bit poorly, I have to go back to wearing my blue one for the time being. 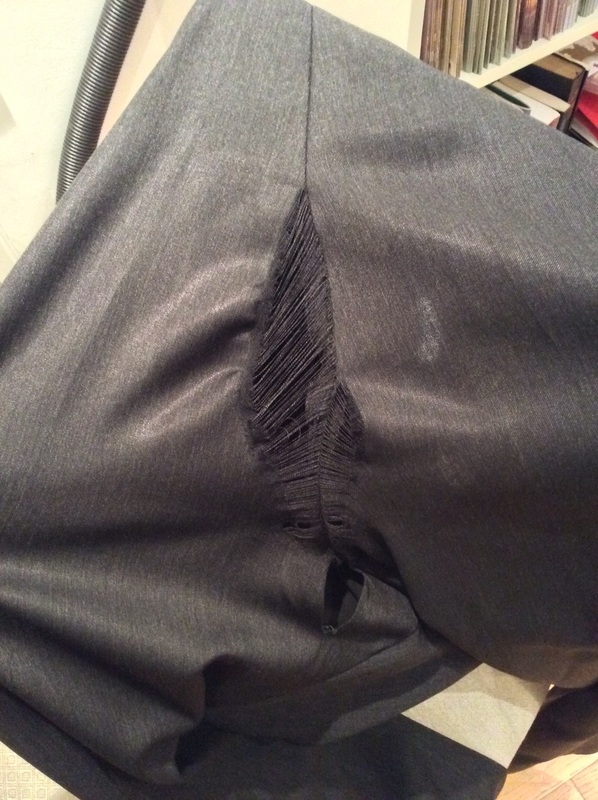 #firstsuitdown #orsecond"... also "So, I did have a pair of trousers that didn't have a hole in them.. But then this happened. 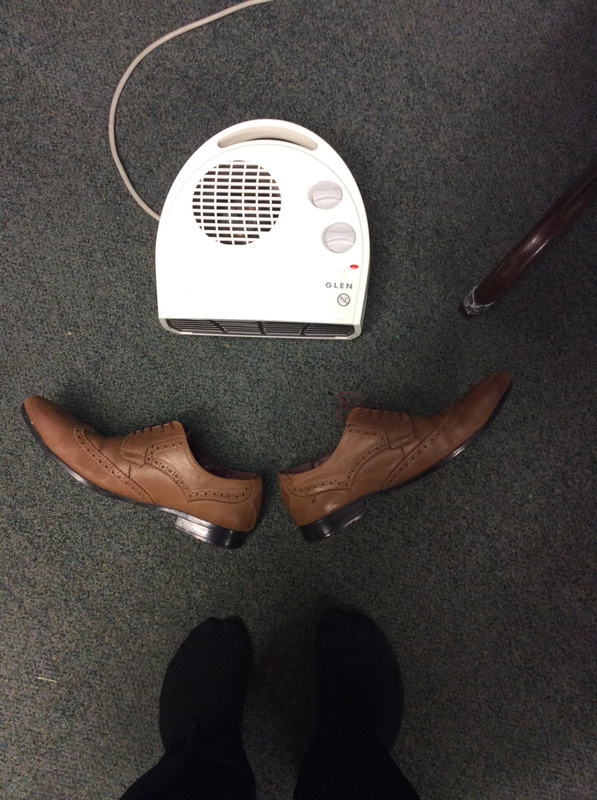 (I was setting up for a training meeting.)" Speaking of photos, Jed saw a photo of his youngest sister and he responded, "Also, Anna looks like a straight up girl now. Keep her away from those of the opposite gender. And buy them blinders, so that they won't get distracted by her beauty. And don't let her have a boyfriend until she's at least 27. And tell her to stop growing, because that would be totally unfair if she ends up taller than me." It is great to see your kids grow up and run out of clothes. In the Book of Alma in the Book of Mormon (Alma 12:24 here) we are told that this life is given to us so that we can prepare to live [forever] with God. We sometimes feel that we have a long time on earth to do that preparation, but thinking about our time here on earth compared with eternity we really don't spend much time here. That said, goals are pretty important. Goals for our personal life, goals to help others, or goals with others. I have really enjoyed seeing goals play out in the life of Elder Murri and his Zone of missionaries. They met together (this may not be the actual video of that meeting, but Jed sent this to his sister entitled, "This is a time lapse of a brief discussion during Zone Meeting..." here). They prayerfully set a goal to help 6 people make the covenant to follow Jesus Christ. Follow Him by doing as He did and becoming baptized, and further promising to keep His commandments and always remember Him. The enjoyment I have had, is watching this goal be set and then be reached. I turn to Jed's words on Feb 1st regarding January: "Some cool stuff happened this past month! We, as a Zone, set a goal to have 6 baptisms this month. God blessed us, and we reached our goal! It was really all Him. Everything fell into place at just the right time, so that we could accomplish what we had been working for. Again, though, it was all Him. We just made ourselves enough of a channel that He could do His work through us that well. It has been a good month overall though. I've grown, the Zone here has grown, and I'm happy with the progress that we've made. I'm not going to take my foot off of the pedal though, I'm going to keep going, and keep trying to progress and get better. I'm going to keep repenting. That's the key to progression, right there. One of the lady's names that was baptised is Jane, and Elder Cook and I gave her her first high-5 the other day. She's so sweet! It's been a good month!" Another goal reached .... well not sure this was his goal. Jed's sister asked him if his companion eats with his mouth open. He responded, "My companion doesn't do that, thank goodness. I think that I'm over that though, it was kinda childish to make a big deal about it now that I look back at it. But that's why I'm so glad for the Atonement, because I can move on and try again. I have a new day to try again! Yay!". I am glad he has also been able to accomplish that goal, (not to be bugged by anyone who eats with their mouth open). His little brothers may have grown up when he returns and we will not be able to really see if this is the case ... we may have to wait for him to have kids :) . Elder Murri is doing well. We (my family and I) were able to Skype with him on Christmas Day! Now, he has sent a few emails since then as well ... so I feel like I need to say, "let me catch you up". Like the last time we spoke over Skype with Jed, we had someone take a picture of him holding his family. This time the picture isn't as clear as we would have liked, but I include it here. On New Year's Day while we were celebrating the New Year coming in, there were plenty of fireworks. We could also see on the TV that there was a great fireworks show in London to ring in the new year. We wondered if he could see or hear them ... he said, "I was asleep, but Elder Cook heard them, so at least one part of the companionship got some of the fun. They actually had us come in at 7 that night, so we cleaned the flat, planned, and organised some things, and then we played a couple of games before we went to bed. 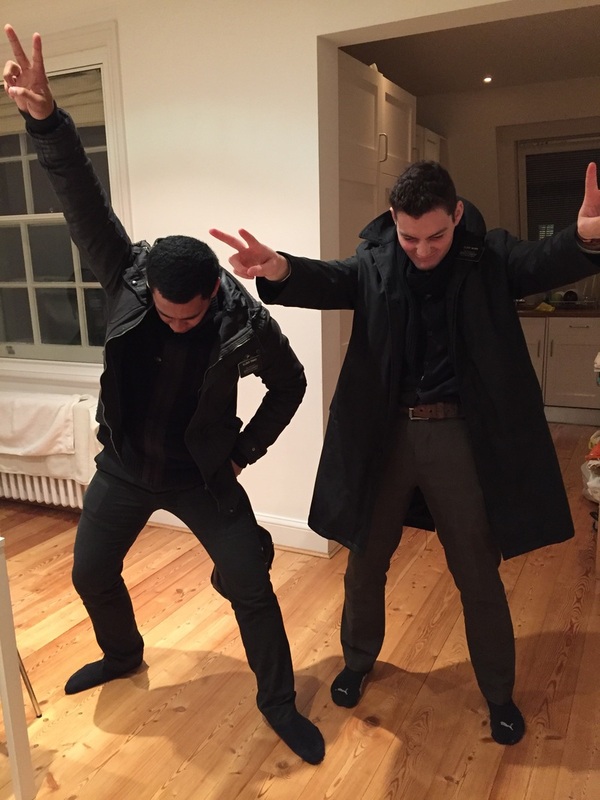 So it was fun here in London as well." In the Church of Jesus Christ of Latter-day Saints members serve in different capacities. Only as a Full-time missionary do you get to serve for a specific time frame (2 yrs for a guy and a year and a half for a girl). Otherwise you may serve in the primary (for kids under 12), or with the Young Women (12 - 18 girls) or Young Men (12-18 boys). This service may be short (I think I once served in the Young Men's as the President for only a few months), or sometimes much longer. 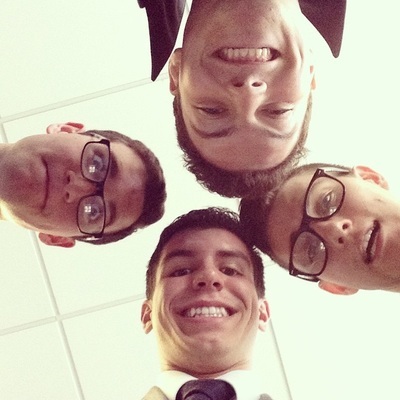 Our ward's Young Men's Presidency just changed. We told Jed, who I think was in Young Men's just about as long as his leader was. He said, "[He] is one of the reasons that I'm out here right now. He's one of the reasons that a lot of boys are better than they were. I think that the Lord will bless him for his service!". The relationships that are formed thru service are awesome. ​We were recently asked if we would share some advice for young adults who were preparing to serve a mission. Jed wasn't able to get us this advice before it was needed, but he did share this: "...I'm sorry that I couldn't get the video [the advice] to you. I could still send one, if you want me to? Just let me know, and if I can do it today, I will do so ... If you're doing things because you love God -- because your motivation is to please Him; then your "whole being is filled with light", just like the scriptures say. I actually had a couple of experiences that illustrate that point...[i]s it ok if I share them with you? The first experience (not chronologically, but the first one that I'll share) happened today in my personal study. We're reading the Book of Mormon together as a mission, and this morning, I read 1 Nephi 6:4-6, which talks about the intent that Nephi had as he wrote the Scriptures. Nephi also gives his posterity and anyone else that would write in the book a commandment that their intentions also be pure. That's such an important word, intention. His intent (and everyone who followed him who wrote) in writing the Book of Mormon was to "persuade men to come unto ... God ... and be saved". That's the Book of Mormon's intention. That's why it's here. I learned this morning that if my intent was also to "come unto ... God ... and be saved", then by reading the Book of Mormon, I would come unto God. And I would be saved. Something would happen! Something does happen! If my intent and the Book of Mormon's intent are the same, then the natural result is that I will come closer to Christ. Note the definitive: "will". I love that. I hope that makes sense. I love the Book of Mormon. So here's my challenge to everybody that reads this: read the Book of Mormon with faith that something will happen inside of your heart. It might not be immediate, but it will happen. When you read it with that intent, then something does happen, and it is immediate. You'll feel the Spirit, and you'll develop a better relationship with God, and with Christ. That's the promise. The second experience is one that's pretty cool, and it illustrates how real and how involved God is in our lives. How much He knows us personally. Anyway, this Sunday past, we had the opportunity to give a couple of blessings. One of them, I was able to give while my companion and another brother from the ward stood in. I always hope that I'll be able to convey the message that God wants the person to hear, and that was my hope this time too. I love how when our intent (See, there's that word again!) is to be an instrument in the hands of God, He'll lead us through the blessings, and "give you utterance". I felt like that was the case this time as well as in times before. I felt the Spirit, it was there. The blessing ended, and this sister from the Philippines stood up and looked at me and said, "Elder, how did you know"? I didn't do anything special, I just gave her a blessing. Blessings are special, I suppose that I worded that incorrectly -- I was just the one who got to give her the blessing this time. But it blessed her life and helped her out, and I guess that's the point of the Priesthood. It's about service. It's about being God's hands on the earth -- to reach out and bless all of His children with the tender mercies that He wants to give us. It's cool to be his servant. If we intend to have spiritual experiences each day, then we will have spiritual experiences each day. We find what we're looking for, and God stands at the door, ready to give us everything if we turn our search (and our intent) in His direction. Growing up spiritually is the best thing that I've ever felt. Alma 5:26." Since we didn't get this advice soon enough, I compiled some previous items I have received from him and forward them. This, along with other missionaries from our stake were compiled and put into this video,here . I told Elder Murri that I was going to share with the youth in our ward some thoughts on Agency and Accountability in a few weeks. Since he is serving a mission teaching people I asked if he had any thoughts or experiences he could share that I could use. He wrote me, "...I feel honoured (and humbled) by your request. I don't feel like I have anything special or different or revolutionary to give you, but at the same time, the Gospel of Jesus Christ isn't different or revolutionary. It's simple. In Preach My Gospel, it says "The principle of accountability is fundamental in God’s eternal plan. We will all stand before the Lord at the last judgment and give an accounting for what we have done with the opportunities He has given us." When I'm faced with a difficult situation, or one in which I'm tempted to make the wrong choice, sometimes I'll think about how one day, I'll have to stand next to Jesus Christ and explain why I did what I did. On the other hand, I think that we'll also be accountable for all of the good choices that we make as well, and God will (and does) bless us when we make the right ones. It's important to make the right decisions for the right reasons as well. It's ok to ask "why am I doing this" ... At the bottom line, we'll make mistakes as we use our agency. I think that we're all aware of that. But there has been a "way prepared", "and salvation is free [to chose]", just like Lehi says in 2 Nephi 2. That was really long, but I think that the most important point that you could stress with them is that when you use your agency incorrectly and make a mistake there IS a way back. There IS a balm in Gilead. There IS hope for those who may think that they have none, and using your agency to use the Atonement and get back on track is actually the most important way that you could use your agency after all. Trust me. I know." He tells me further that "...Those are my two pence. (I've been saying that to everybody, do you like my British reference?)" Yes, I like his 'British speak', and like his Mom has told me a few times recently after reading his emails I feel like, "he get's it". So there is a newsroom for the Church of Jesus Christ of Latter-day Saints for different areas. The UK newsroom (link here) is reporting that there is a 'live nativity' outside of the Hyde Park Visitors Center. The post on the newsroom site tells us that, "This is one of the most popular areas in London where annually more than 10 to 11 million people walk on this street. Each evening from 5-7pm, live actors will portray Joseph and Mary." Here is a picture of Jed in that live nativity. We think that Jed's companions (or one of the Elders in his Zone?) picture was on the UK newsroom site, because he describes the picture above with: "A live nativity on the most walked street in the world! 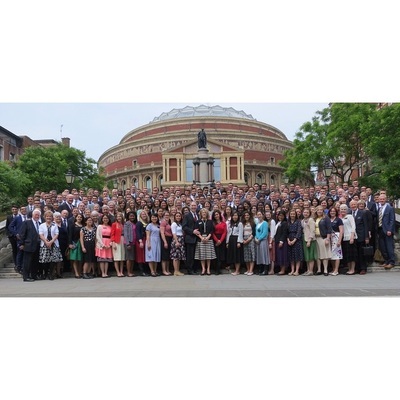 Elder Cook made it on to the Mormon newsroom uk!") 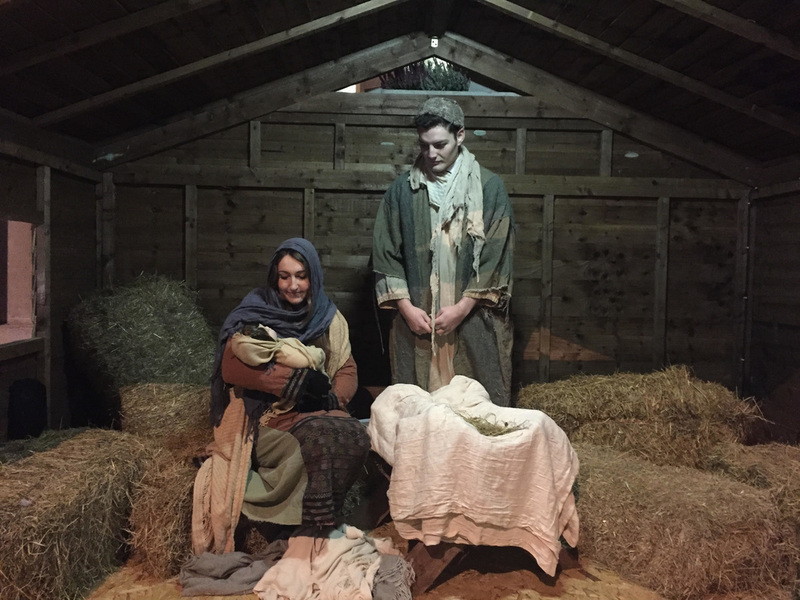 This live nativity is part of the worldwide initiative entitled "A Savior is Born" - link here . He also shared a few additional photos; one celebrating an Elder in his Zone's 20th birthday, and one with the whole zone together. Jed says, "Elder Quoos is from Brazil. He was 20 yesterday!" ​Elder Murri's mom also received a nice email from a senior couple serving in England. I was touched by her kindness, and by Jed's gratefulness. I also hope he is getting enough to eat. 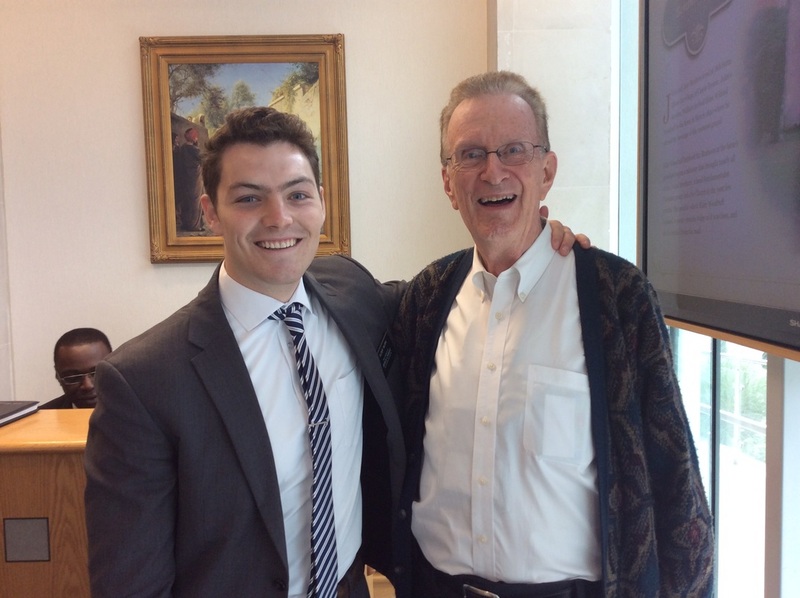 As a senior missionary here in London we have had the privilege of meeting and visiting with your son quite often. To explain why we see your son so often is that my husband and I are the Public Affairs missionaries in the European Area. Our office is just down the hall from the mission president so we get the opportunity to visit with your son almost every day. He is truly a delight to be around but more importantly he is a very faithful missionary that is having a VERY POSITIVE EFFECT on many people her in the London mission. We have had the opportunity to talk about our families and he has told us about his youngest brother missing him as we have told him about one of our grandsons that is very upset with us for leaving him and going on a mission, they are both about the same age. I want you to know that I have observed him being a strong and very influential leader with the other missionaries with whom he is serving. They admire him greatly. I had a unique experience with your son the other day that I wanted to tell you about. I have to keep cookies and drinks here in my office to serve in the event that someone comes to visit us and when the juice or cookies have expired I have to get rid of them. Anyway I had a quart of juice sitting on my desk and your son came by to visit with us and I asked him if he would like the quart of orange juice that had just expired. He acted like I had just given him the most wonderful Christmas present ever. He was so grateful. The next day I say him with some other elders in the Tube station and again he thank me for the juice that I had given him the previous day. I want you to know that you and your husband have done a wonderful job raising a remarkable son of God. 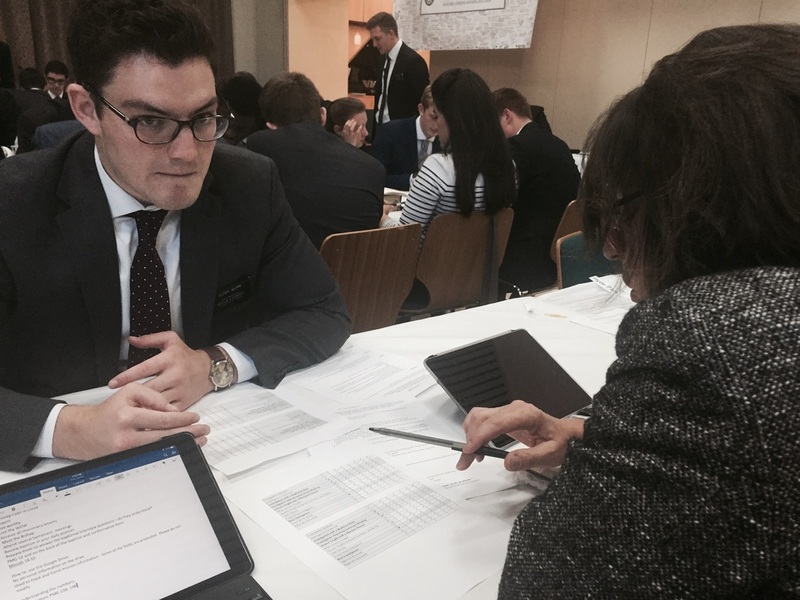 Your son (Elder Murri) is blessing the lives of many in the England London Mission. This past week my family (minus Jed) had the opportunity to sit in the bishop's office in our local ward building (where we have church). We were there for what we call 'tithing settlement'. This is a time where we can declare before the servant of the Lord (the Bishop) who is acting in behalf of the Lord Jesus Christ, where we stand regarding the law of the tithe. During this conversation we spoke of Jed and England. Our Bishop also served in London as a missionary. He said that he remembers that they love to mash everything. Mashed potatoes, mashed carrots, etc. He said that he grew to love it. So I asked Jed about this and he told me, "...As to what Bishop said about how Brits eat, what he said is totally true. Mashed potatoes, mashed carrots, mashed turnips, mashed potatoes remashed because they haven't been mashed enough, mashed eggs and toast, mashed milk and cereal ("eat it all at once!") all kinds of mashed things. I'm kidding about the last two, but you get the idea. And yeah, tonnes and tonnes of gravy. But it's good, and I like it. They also do a lot of roast vegetables, which I've developed an affinity for as well. If you go out to the countryside, you get more of a classic english dinner - roast vegetables, mashed vegetables (mashed ice and water -- "drink it all at once") (just kidding, they don't use ice out here) (but if they did, they'd probably mash it), roast meat of some kind (I've really developed a love of lamb since I've been over here. I don't know if it's more healthy for you or anything, but I sure hope so, because it tastes so good), and gravy. There's usually always dessert afterwards as well. Usually chocolate of some kind. Their's is better than ours. Anyway, I'm on a long escapade about food, so I'm going to stop now, but to answer your question that I should have answered by now, in London, you get some cosmopolitan kind of meals, so I eat differently every time I go to a member's house over here. If you're out in the country, they're usually more english. Mashed...". It was perfect timing for me. Thanksgiving, where in the United States are focusing on being thankful, I heard from Jed! Not only did I hear from Jed, but he shared a few things. 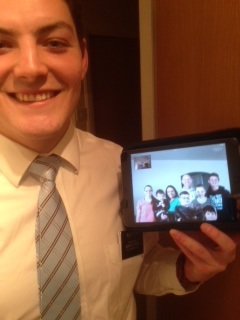 In addition, we heard from a sister who doesn't know us, (and we don't know her) but sent photos and a video of Jed. She was there on holiday and was invited to a family home evening with her landlord and the missionaries. I am feeling like I want to coin an allegory about the feast of good food at Thanksgiving dinner and the feast of info about Jed in England all at once. Honestly it feels like it has been a while since we have really heard from Jed and now I get this. He confirms this in the video I attach here. I believe it was made as he and his companion were leaving the visit. I will paste the URL here, which may not work on Android devices but will work on PC or Apple products. Either way it may ask you about installing Dropbox or creating an account (I don't think you need to, just enjoy the video): https://www.dropbox.com/s/fpw2g61npdmy91t/Video.MOV?dl=0 . What a treat. Love his laugh. I can see him start to smile as he realizes how funny it sounds that he loves his Mom but doesn't write to her. Classic. She shared a few photos with us as well. ​We learned a little about his companion in the last post, but I learned that they now each have new companions. Elder Murri says, "...It's transfers week (hence why I didn't email you yesterday), so my beloved companion will be leaving me. He's going to a place called Milton Keynes, it's in the Northampton Stake, which is in the countryside, so he's leaving London! I'm getting a new companion called Elder Cook. 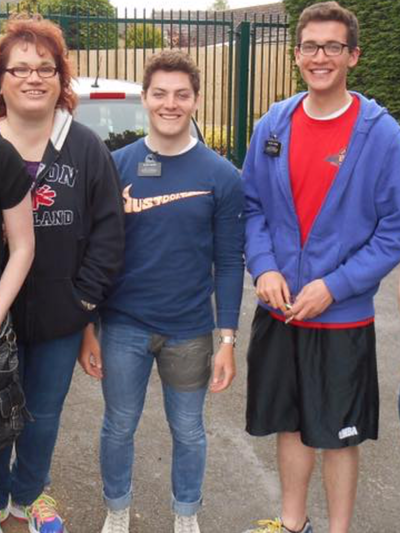 I was his Zone Leader up in Watford, so it's going to be really cool to be able to be serving with him! He's from Utah, and he played football as well. I forgot where he played (I'm not with him yet -- we find out who moves where on Monday, and then Tuesday is PDay, and then we move on Wednesday morning), but I'll ask him. I'm staying in Hyde Park...". I asked about 'P' days, (or Preparation days). These are the days to get ready for the next week, laundry, shopping for food, etc. I also know that you are in a very different place and might want to look around, spend time with other missionaries or etc. if there is time. I was curios what experience Jed was having in regards to this day. He shared this, "P Day. The rules are that we have to have 3 hours of work on P Day. So we do that. We also have to clean, shop, and email before our other activities, but we've had some awkwardly placed appointments this past transfer which have made those things a little bit harder. But we get along as best we can. President and Sister Stevens are making a big push to have our flats clean before we do any more zone pdays (missionaries formally getting together and doing something), which I completely agree with. So to answer your question, we have to ask for permission before we do anything with any other set of missionaries. .... My favorite p days are ones that you can just sit down at the flat for a little bit and rest. I took the first nap that I've ever taken on my mission the other week. It was so good. There isn't a lot of time to do that out here. p days are pretty busy.". I guess given the video and the season, I end with Jed's words in his email to me: "I hope that this was a better email. I'm sorry that I haven't been that good at it lately. I love you guys.". Yes Jed, you are doing great! Elder Murri was asked by his Mom what he wanted for Christmas, and a few other items. He shared some interesting things. First, to fulfill his Christmas wish; please take a moment and write a quick note to Jed. I guess not really and email (you can certainly send that), but a note. He shared this as what he wanted, "...Honestly, just some notes would be good. Maybe some lucky charms. That's it. Notes and lucky charms." I have (if you go the the 'Contact Elder Jed Murri' section of this blog) his address. Oh what fun it would be for him to receive a bunch of Christmas cheer via letters. places. Basically, our ward is central, central London. We just don't have anything south of Thames. Speaking of that, we walked past Simon Cowell's house the other day! The owner of a store called Harrods lives down there too. This is a crazy place. ... My companion's name is Elder Tinao. He has a big heart." I want to end this post with Jed's final thoughts this past email "I'm running out of time, so I'm sorry that this isn't long. But I love everyone. I KNOW that the Gospel is true. I know that Jesus is real, and He lives, and He loves us. I know that before the miracle, we have to have faith. Faith precedes the miracle. But we can choose to have faith. I love you all, so much!! I have been a little under the weather as of late. While laying in bed a few mornings ago ... my wife received a text message from a member of our ward. We learned that the parents of these members (the Jackman's) are also serving in London England on a mission and have worked with Jed! Along with the texts, they sent a few photos of him at a mission conference which I include here. They said, "Jed says hello!!" They also texted an excerpt of an email they were sent. It reads, "As you know we spent some time with Elder Murri. He is an impressive missionary and an exemplary leader in the mission. Please pass on to his parents that we were so impressed with their son. They can be so very proud of him!" That was fun and it was nice of them to share with us. It helped pick me up. Jed did tell us where he is now in his email to his Mom on Oct 11th. He shares, "Hey mom, sorry that I didn't email you on Monday, it was transfers. Long story short (not really a long story, but that's a good phrase), I'm being transferred to Hyde Park Zone in the middle of London to be a Zone leader there. I'm sad to leave Watford. I really love it here. I really do. I love the people, I love the area, I love our investigators -- our friends -- that's what they are to me (we have a couple who are so, so close to their dates, and I'll miss them now), I'll miss my companion, Elder Wright. He means a lot to me and I've learned a lot from him. I've learned a lot from my experience here, I'll be sad to go. But I'm super excited for the next chapter! I'll let you know how it goes." He also shared some special feelings (members of the church call this their testimony) ... "...I'm praying for dad. I don't know what else to do but work hard and hope that the Lord will bless him for the work that I do for Him. I'm telling you this to keep myself accountable. I know that Heavenly Father will bless dad, and the rest of the family. I know that He responds to sincere prayers. I have a testimony of that. I know that He is up there. I know that He is listening. I know that the Gospel blesses lives, regardless of the state in which they're currently in. Those things are all true." I am moved by Jed's words, "... He responds to sincere prayers..." as I also know that to be true. We got a call from some elders in a place called Tendering, and they gave us a referral, her name is Melanie. We went to contact her as soon as we could, but we couldn't find her. We went probably three more times, and encountered some serious resistance each time, weather it was people telling us to bug off, or swearing at us, or slamming doors in our face, or trying to distract us, all of them were crazy. We couldn't contact or find her, but we knew that she was precious to God, and so we kept trying to get a hold of her. One day in the car we called her randomly, and she answered! We set up an appointment with her, and later met her at the chapel with our ward mission leader, Joel. We gave her a tour of the chapel and taught her about the Gospel of Jesus Christ as well. We ended at the Baptismal font, where we invited her to be baptised, and she said yes! Without reservation or hesitation. The Spirit was there, and it was very strong. It was awesome to be able to feel an honest concern and desire for the welfare of her soul. She'll be baptised in two weeks. The ward loves her, and she loves the ward. I love them too. This is the work of God! I know that it's real, and it is "A marvelous work"! You should never apologize before you start something, at least I have heard that somewhere. Let me start this post with this statement ... sorry it may be a little long. This past weekend we didn't attend church meetings as normal, instead we watched the apostles and Prophet speak to us about our time. We call it General Conference. With technology you can watch it right from lds.org, 10 am and 2 pm Saturday and Sunday ... with a 2 hr Priesthood session Saturday evening. Even if you missed a talk or session you can watch it on demand. It is really an incredible time, as they receive (just as Noah did before the flood) info that we need to hear. It occurs every six months. Given that we weren't getting ready to go to church we had some time at home together. I am pretty sure all of us had a chance to write to Jed. I wonder if we should have limited our emails so he had time to read them and respond. Anyway ... he seems safe, happy, learning and serving. So I asked Jed if he has ridden in a double-decker bus yet, and if he has has he ridden on top. He said, "To answer your question, when I was in Enfield, that's how we got around, we rode busses, so I sat on the top a lot, although we'd sit on the bottom most of the time, because it's easier to talk to people there. But yes, I've been up there." He isn't riding the busses now, he says that he is in a car ... "We have a car, so we drive everywhere now. We made a goal to park it one day of the week so that we can talk to more people, so that's going to be fun!" It is interesting that in both of his statements he said that he is still trying to do things to be able to talk to the people. A missionary is known for doing that, talking to people. There are other important things that take place during a given day. One of them is companionship study. An Elder (or Sister) is expected to not only read and think and pray about the scriptures on their own, but also with his or her companion. I asked Jed if he was doing this. His response reassures me that his is doing his best to serve with all his might. "And yes, we do companion study. Elder Holland said that you make or break your mission between the hours of 8 and 10[am], which is study time. Which is true!". and so cars were avoiding me and honking at me and waving at me and the whole time, I was wondering "Why the heck are all of these people driving in the middle of the road?"". Granted, there are Elders and Sisters that get hurt while serving a mission ... but I fully believe there is protection offered from our Heavenly Father as they place him first. Elder Murri has been able to see many people get baptized into the Church of Jesus Christ of Latter-day Saints. He has seen miracles, many of which have been shared on this blog. One however that I will share from his letter shows another gift given from our Heavenly Father to those in His service. "We had a miracle yesterday. We went to contact a less active member of the church, and she wasn't there, so we decided to knock four doors next to her house. We felt drawn to one door, so we knocked on it (get ready, this is a little bit of an out of the ordinary missionary experience), and a guy answered and looked at us and said, "Hi, come in"! That was the first door that I've ever gotten in on my mission. I don't want to give credit where it's not due though. To be fair, that was all the Lord. That was Heavenly Father. Anyway, we sat down and were able to talk about the Plan of Salvation with him and his wife. He's from Albania and she's Romanian, and they're going to get baptised next month! That was a miracle." There are of course the mundane needs of a missionary. He has to eat. Luckily there are familiar places ... "Guess where I'm emailing you from now? Costco! Yes, we have one of those in Watford. I may have already told you, but I'm excited, so I can say it again, I think. And yes, I'm going to buy a massive slice of pizza and eat it all." He did send a photo of one of the districts in his Zone. He says about the picture ... "This is one of the districts in our Zone. Represented are Ghana, Colorado, Switzerland, Southern Utah, Wales (he speaks Welsh), Spain, California, Utah Valley, Texas, and Chile. Cool huh?" The missionary zone that we live in (in Eagle Mountain) is having a zone conference. A zone conference might include some instruction from the zone leader, an elder or sister from the zone, possibly a bishop or member of the stake presidency (or the mission presidency). This particular conference is being held in one of the buildings close by and Marcie was asked (because she has a missionary out from our stake) to prepare a refreshment for the end of the conference. The idea is that she should make one of Jed's favorite desserts (each of the 'missionary mom's' would do this) and they would have a fun little smorgasbord of choices when the conference closes. My wife and I looked at each other and said, "what is Jed's favorite dessert"? We know he liked to cook my grandma's chocolate chip cookies, but I guess we didn't really know. So she asked him what his favorite dessert was adding... "...I am excited to help with it. It is good to serve missionaries as I hope people do for you in England...". Mom's are always thinking of their kids. Jed responded this way: "One of my favourite desserts is brownies. And chocolate chip cookies. And pie. And Cornish ice cream. And biscuits. And chocolate. And cake. And custard. And cake and custard put together. That's about it. :)" I enjoyed that he added a few more than just one, and that he has gained a few more that we don't eat here in Utah, and his spelling of the word 'favorite' (English). I guess we will see which one she makes. I believe I shared in a previous post that the President of the London Mission (and his wife) were recently released. We haven't heard Jed's thoughts about the new Mission president and his wife, but he told us this last letter. He said, "I LOVE President Stevens. I LOVE his wife as well. I love and look up to and revere them both, so much!" So I gave this post the name "A short hello" as Jed also shared this (and then he was basically done) ... "I don't have a lot of time, today has been hectic. We went to a place called Aylesbury today, so we've been traveling for a lot of the day, but it's been awesome! I'm so busy, but I get to forget about myself for a little bit. It's really good, and I love doing it. I really love helping other missionaries! Honestly the best times when I served as a full-time missionary were those when I was busy, and as Elder Murri says "... helping other missionaries...". 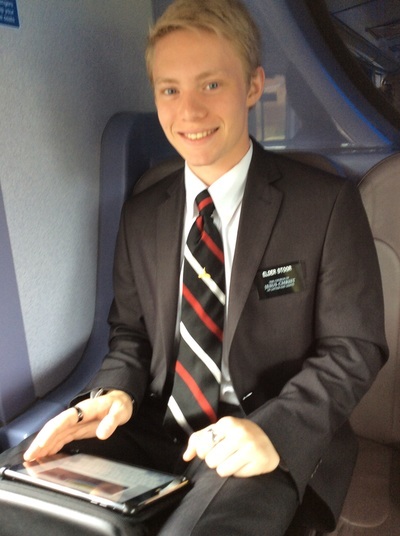 Here is a photo of his new companion (Elder Wright). My wife heard from a neighbor that they had family going to England ... and if we wanted to send a package they would be happy to take it there for us. Marcie hurried and put together a package. We got a text message a few days later telling us that he got the package and that he had a new companion and was a zone leader. The England (and all other) mission is divided up into Zones, then further into Districts, then further into individual companionships of either Sisters or Elders. We did not receive a letter this past week (other than this news). We did get one yesterday however. I am sharing it as he shared it for the most part. Hey mom! I feel like I haven't talked to you for ages! Thank you so much for the package! It was way cool! I'm even wearing one of the tie clips right now actually! :) Thanks for the notes and everything as well. I feel really bad that I haven't been able to talk to you all for the past couple of weeks! I'm sorry about that. Today is p day for us, because we had a mission wide conference yesterday win Clayton Christensen, the guy who wrote "The Power of Everyday Missionaries" or something like that. It was awesome. It was also the reason that I'm emailing you today, rather than yesterday. But it was so good. The Spirit was there, and it was so good to see other missionaries who have become my friends again. I love them all. Being a zone leader is cool, because there are so many opportunities to serve others. You have your area, and your companion, but you also have your zone as well. I'm filled with love for each one of them. I want to help them feel the Spirit, and feel the love of Heavenly Father as I speak with them. I want them to grow, and to be leaders. I want them to be happy. 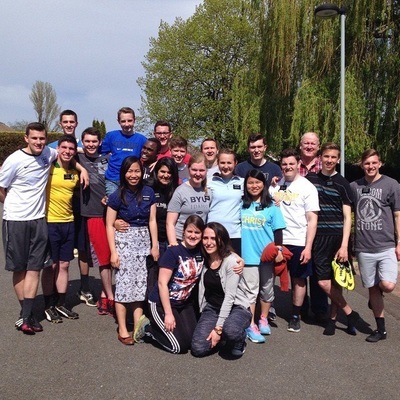 There's a lot of new missionaries in the zone, so I feel a responsibility to help them begin their journey here in England on the right track. It's different. Almost like you're married, I think. I wouldn't know, because I've never been married, but we're both united in the same cause. We both have the same vision, and it's really cool to talk about it when you don't have he same vision, or when you disagree on your plans, because everyone is different. And sometimes their ideas are better than yours. My companion's name is Elder Wright. He's from Compton California. He's really an inspiration to me. He's a convert to the church, and that viewpoint helps him to identify with other people. He does that really well anyway, but he's just a really cool guy. He has a lot of talent, and his heart is definitely in the right place. That makes me happy to see. Also! I'm serving in Watford now, which was the first stake that I served in on my mission! Enfield is in Watford Stake, and we're going on an exchange there this week! It's like I'm returning home! I love you guys a lot! Thank you for everything! "Service and sacrifice are really cool. The more that you do those two things, the more capacity you have to love, and learn, and feel the Spirit. I'm grateful for those two things. The scripture in Matthew that says "He that findeth his life shall lose it: and he that loseth his life for my sake shall find it", I feel like that's true" says Jed to his Mom. Further ... "A miracle that happened today, we were walking down the street, and I all of the sudden had the impression that I should be looking for someone to talk to, so in my head, I had sort of a dialogue with the Spirit. I asked Heavenly Father to show me who I should talk to, and then looked around at all of the people, when one guy popped out at me. We started talking to him, Elder Stoor and I, and we're seeing him now later in the week! God is so willing to bless us and help us bless other people's lives, we just need to keep our eyes up". Some additional experiences: "...there's this lady named Sister Allen, and she buys us food every week, which is so nice of her, so on the way down to pick food up from her, we started talking to a bunch of people, and we set two return appointments and met a bunch of people that we've lost a little bit of contact with, and that we're going to see next week, and then walking into the library, we saw a potential investigator that we had scheduled to see later today, and we met with him and was able to confirm an appointment with him, and he even told us to come over! Just today, my testimony was really strengthened that the Lord puts people in your path. It's been a good pday". Lastly, I received an email from Jed that said, "HAPPY BIRTHDAY!!!!!!!!!!!!!!!!!!!!!!!!!!!!!!!!!!!!!!!!!!!!!!!!!!!!!!!!!!!!!!!!!!!!!!!!!!!!!!!!!!!!!!!!!!!!!!!!!!!!!!!!!!!!!!!!!!!!!!!!!!!!!!!!!!!!!!!!!!!!!!!!!!!!!!!!!!!!!!!!!!!!!!!!!!!!!!!!!!!!!!!!!!!!!!!!!!!!!!!!!!!!!!!!!!!!!!!!!!!!!!!!!!!!!!!!!!!!!!!!!!!!!!!!!!!!!!!!!!!!!!!!!!!!!!!!!!!!!!!!!!!!!!!!!!!!!!!!!!!!!!!!!!!!!!!!!!!!!!!!!!!!!!!" and that was it. It was nice. "Just kidding, I'll write more than that. I hope that you have a great birthday this week. I love you. You're up there in years! You're becoming wise! haha :) I hope that you have a great birthday. The library closes pretty soon, but I just want you to know that I love you with all of my heart, and I know that families can be together again. I know that they can be together forever. I'm so grateful for that. You've done so much for me, and I love you for it. 1. You're a real person. You're honest. That means a lot, especially in this world. 3. Everything you do has been for us and for Mom. I notice that and I love that about you. 4. You have a testimony of the Gospel. I've heard it before. I still remember when you were talking in the McKinley ward about how you enjoyed talking to your son (me) about the Gospel under the stars. That touched me then, and it still touches me now. That's one of my favorite things about you. 5. You love your family. 6. You like bikes, and music, and watching FOOTBALL ON SATURDAY. 7. You care about what your kids care about and you support them in what they do. That means a lot. Thank you. I didn't receive an email from Elder Murri at the end of July. Marcie however did get an email from a member of the ward where Jed is serving that week. I really enjoyed it and will share some of it a little later. "And when the Jews heard these things they were angry with him; yea, even as with the prophets of old, whom they had cast out, and stoned, and slain; and they also sought his life, that they might take it away. But behold, I, Nephi, will show unto you that the tender mercies of the Lord are over all those whom he hath chosen, because of their faith, to make them mighty even unto the power of deliverance". I know that the Lord gives us all tender mercies, and we can see them, if we choose to. I know that He gives you all tender mercies. I like the part when it says that the Lord will make us mighty, even unto the power of deliverance. I re-read and re-read that last part over and over again when I read it the first time. I think that it ties in really well with your scripture. Jesus Christ's love is real. I believe in Him. I'm coming to know Him as my Saviour. I love Him more and more each day. What a great thing that that is." I mentioned the letter from a member of his ward in King's Lynn. I re-read it a few times. I feel like I would like to share a good portion of it. ... 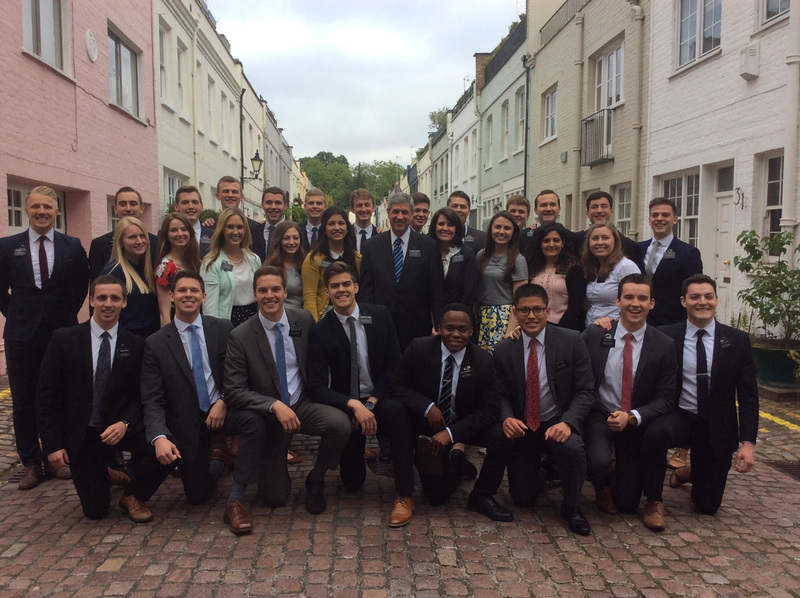 I live in King's Lynn in Norfolk, England, one of my callings is as a ward missionary so I get to spend lots of time with these amazing young men and woman who serve the Lord full time. Thankfully he takes this all in good humor. He has grown up so much since he has been here with us in the King's Lynn ward. I have see him go from a great young lad who wanted me to adjust his trousers as they weren't fashionable enough for him to possibly the humblest man I have ever had the privileged to know. One particular thing about Elder Murri is he is so dedicated, and with the other missionaries, the Sisters and other Elders I have seen a great leader and so much love that he has for those under his care. I certainly have a huge soft spot for your son. When he speaks while bearing his testimony the Spirit envelops everything... the strength of the Spirit emanating from him makes me cry every time! I have had to make sure I am wearing waterproof mascara when I go teaching with him! I have included some pictures for you as he says he hasn't sent you very many, there have been good times, fun times as well as difficult and frustrating times, but Elder Murri comes out smiling every time. I have sent you pictures of Him with a couple of companions at different members houses, playing with marshmallows seems to be a theme. He and his companion and an investigator came to help me decorate, I have unusual taste and so I wanted a mixture of pictures on my wall... have way through poor Elder Murri looked so concerned and said "Oh ... I feel like I have ruined your wall" Bless him! I love it though, I have been adding things to my accent wall (it is a work in progress) and as long as I stay in this home I will always remember his help. We taught an investigator about the Word of Wisdom, and during the lesson the investigator inadvertently called me fat, I pretended I didn't hear and carried on as if nothing had happened, but for a second or two your valiant son and being the gentleman he is, looked like he was going to defend my honor and throttle the guy LOL! I cannot even remember how many patches I've had to sew into the seat of his trousers but it's always funny when he and his companion come to me and Elder Murri has a sheepish look on his face then asks if I can fix them again! Bless him, the seams are always splitting... too many thigh muscles LOL. One time he was so ill bless him, he was falling asleep on his feet, and coughing every two minutes, there are some pics of him with a bottle of my homemade cough mixture, honey, lemon and cinnamon. It did the trick! [There is a brother who] is not a member of the church, and can be "difficult" though Elder Murri and his companion Elder Hessen taught him for a while. Every time [this brother] speaks of Elder Murri when they have bumped into him in town, they have been nice words, I think even though he won't admit it, [he] can also feel the Spirit when Elder Murri teaches. I wanted to write to you to thank you for being such a wonderful example to Elder Murri and for helping him to come on a mission. He says he doesn't want to be the same person he was when he started, I can testify that he isn't. The Lord is shaping him and Elder Murri is raising to every challenge the Lord wants him to learn from. I have seen it, and I have such admiration and love for the fantastic example Elder Murri is to me. I appreciate that Sister taking care of my son when he is sick, or when his pants are having wardrobe malfunctions. :) I really appreciate her love to him and that she would reach out and share with us her experience. Jed says that, "The work is going well here. We baptised a British girl ... a week ago, and she's doing really well. She's going to the temple this weekend, and I'm really really excited for her! Being given the responsibility of caring for a district (that's all made up of sisters) has also been a learning experience for me. But it's been so good. I've learned so much. Whenever I write emails home, it seems to be that I can't remember all of the bad things that have happened, only the good ones. And I love that. I love my mission! I love England!" Really loving, and spending day and night working to help others realize the blessings Heavenly Father wants to give them can be difficult. I believe that as Jed told me above, "...the Lord gives us all tender mercies..." - only remembering the good things is one. That might be a good scripture to re-read in Family Home Evening one of these next Monday nights. I asked Jed a series of questions and he answered them. Elder Murri is able to do service for others, he says: "We met a small family a couple of weeks ago, and we just painted their house for them, and they told us that they'd have to have us over for dinner this next week! He was in the military, and he went out to [Tooele] to train with the U.S. Military, so he's been to Utah. Him and his wife are really cool. He calls me "Elderberry" because that's what my name sounds like. Haha :) He's so nice and kind, and so is his wife, and the Gospel is what they're looking for. It's so cool to talk to them!". This past week we spent time visiting the Grand Canyon. It truly is an amazing sight. Although pictures cannot due something like that justice, I sent one to Elder Murri of his Mom and I overlooking that massive canyon. He told me, "So, I'm downloading the picture now, so I haven't seen it, but it sounds super majestic, and I think that's awesome. One of my favourite things about English scenery is that in the morning hours, if you're taking a bus and it's wet outside, there's white mist that hovers over the ground and the hills, and it's so gorgeous! It's like that right now actually! The green and the white and the grey are so cool! ". We (God's actual spiritual offspring) have been given so many wonderful things. Elder Murri said it best this way, "The perspective that the Gospel brings is priceless, that's why it's so important to share!" So let me start by explaining the photos. Elder Murri has shared that the London England Mission President and his wife (they usually serve for 3 years) are being released this next month and returning to their home in Utah. He has really enjoyed their service, help and guidance and suggested that we (his parents) should probably attend the 'homecoming' meeting. I put homecoming in quotes because the meeting where they share some of their experiences with the members of their ward is really a normal sacrament meeting (where the main purpose is to take the sacrament - and recommit to trying to live as Christ would have us do). After the sacrament the ward members then are able to listen to a few folks (also usually from the ward) who have prepared some words of counsel. Anyway, we were looking to find the date of this homecoming, and found her Facebook page (one she keeps about the London England Mission). On it we found a photo of Jed, his companion and two other Elders who apparently 'got a hold of Sister Jordan's (she is the mission president's wife) Ipad' (just their faces). We also found one of him with other Sister missionaries and Elders after having done some service project. Then there is one of the entire London England Mission after having met with an Apsotle (Elder Jeffrey R. Holland). 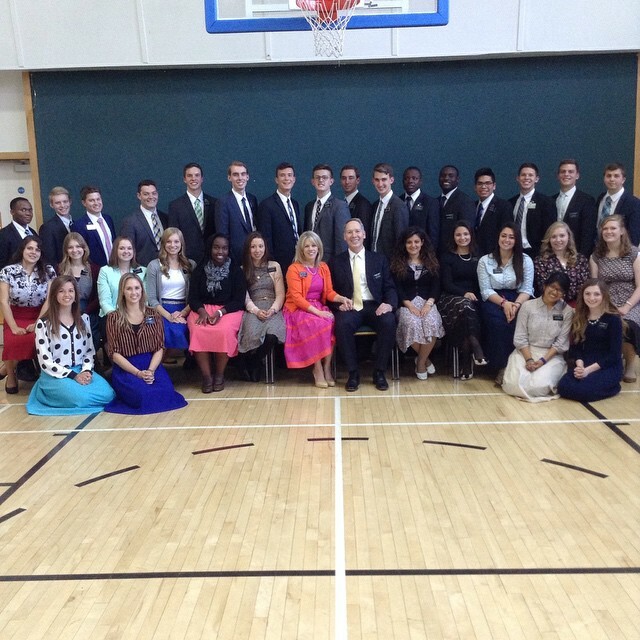 There is one of the Elder's and Sisters who were going to be training new missionaries. I told my wife as were were looking thru them (and she was downloading left and right) that it looked like it was Christmas for her. As we were looking we found that each Elder and Sister has a Facebook page! Elder Jed Murri has a Facebook page! 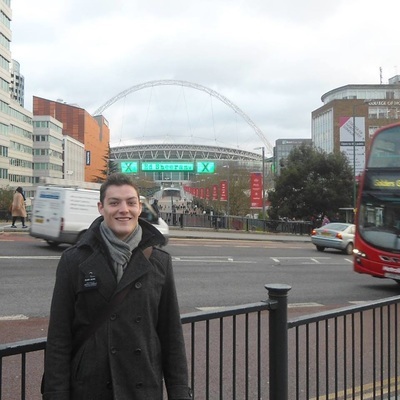 We found a few more photos on that page, one of Jed in London in front of some arch (maybe I should know what it is?). What fun this was to see some of his experiences. Even better ... in his recent emails, he sent us a photo of his new companion ... and a photo of his torn trousers (see the last post for more on that - duct tape is amazing). So the photos make it feel like the world is a whole lot smaller. Jed said something like this in his letter to his mom, "We met a guy yesterday who went to Tooele for a little while and ran around with the US military for a bit actually! It was crazy to see how small of a world it is! We're helping him move a load of rubbish from his back yard. Hopefully that opens the door to share the Gospel with him." As I mentioned above, Elder Murri has a Facebook page so his mother tried to friend him and he told her, "Yeah, I saw that you requested me. I can't accept it though. The rules are that you can't have anybody back home as your friend unless there's a real missionary purpose behind it, in the which case, it's fine. I do get on pretty often, we can teach lessons over facebook, and facetime teach lessons and skype teach lessons and all of that fun stuff! I haven't done much of it, but it's really cool, because it takes away all of your travel time! You can just teach a lesson right there! ". I can see how technology is being used for good. Jed has been looking forward to meeting Elder Jeffrey R. Holland - a living apostle of Jesus Christ. He did get that chance. He says this, "I got to shake Elder Holland's hand a couple of weeks ago and tell him my name and where I was from, and while he was giving his talk, he said something along the lines of "I wasn't concerned about what your name was or where you were from. I wanted to have a little personal interview with each one of you. I wanted to look into your souls!" So that was pretty intense. " He ends his last letter to me this way, "I don't have much time, but I love you. I hope everyone is occupied. I love training. I love being able to help my district. I love my mission! I love the Gospel! I love the Book of Mormon! I love you! Alma 17: 8-12 are good scriptures.